That's all from here ... Hope all of you have enjoyed the coverage !!! This game will help the coach to analyse the players better than ever ahead of the ISL season !!! 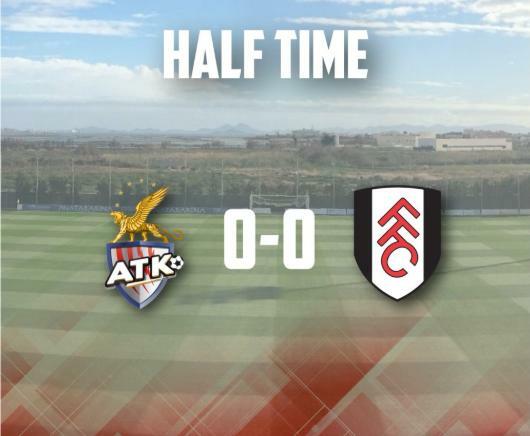 Full Time score: ATK 0-1 Fulham !!! Time's up for ATK !!! The Kolkata based team lost to Fulham FC by a 71st minute strike from German Andre Schurrle !!! 86' Substitute Sheikh Faiaz crosses the ball into the box in an attempt to find Balwant ... but the shot was not precise !!! 78' ATK pressing hard for the equalizer ... but the defense is hard to break !!! The German winger gives Fulham take the lead .... ATK 0-1 FULHAM !!! 71' GOAL !!!! Andre Schurrle curls it into the bottom right corner after he received the ball outside the box !!! 59' Everton Santos is back on his feet !!! 51' SAVE from Arindam .... Fulham players were eyeing a first goal but the custodian did hid job to perfection !!! 47' Bikey clears a ball early in the second half after it was sent in from the left !!! Stay tuned for the second half !!!! End of the first half ... It's goalless here at the Pinatar Arena Football Center !!! 44' ATK player Mauel Lanzarote's free-kick is saved by the shot-stopper, Fulham break on the counter but nothing fruitful emerged out of the attack !!! 42' John Johnson clears it this time ... ATK is defending well, a good sign ahead of the 2018/19 Indian Super League !!! 40' A cross from the right by Fulham into the box, Aibor again to the rescue !!! 35' Fulham's defender Maxime Le Marchand shots from a long range, but the shot is narrowly wide !!! 25' A cross down the left, Arindam makes use of his height to grasp the ball but he slips, eventually the ball deflects from a Fulham player to go out for a goal-kick !!! 23' The English side is playing possessional football at the moment .... the shot from the right was way off target !!! 15' Vietto's shot sails over the net .... Fulham FC yet to break the deadlock !!! It has been box to box action in the opening 15 minutes of play !!! 14' Kalu Uche with a brave effort for ATK, but the shot was wide !!! 4' ATK with a prompt start, Manuel Lanzarote with an attack down the left, he sent the ball into the box but the Fulham FC defenders clear it easily !! The game has kicked off under an overcast sky at the Pinatar Arena Football Center in Murcia, Spain !!! We are minutes away from the kick-off !!! Hello everyone !!! Welcome to the our live coverage !!! Two time Indian Super League champions ATK is looking for fresh start after a disappointing show last season, their worst ever. 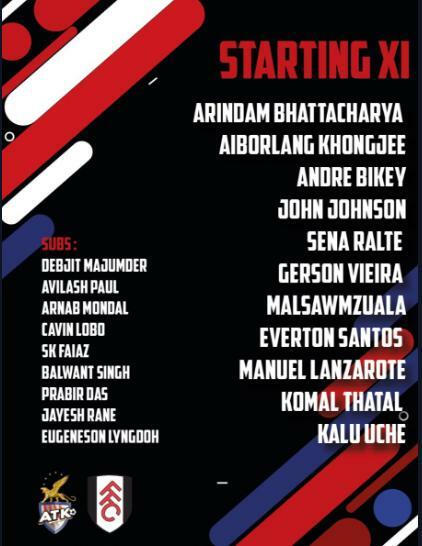 With a new faces in the squad and the presence of Steve Coppell at the helm of affairs, the ATK fans can expect a good show in the upcoming season. English Premier League side Fulham FC is in Spain for a one-week training camp due to the International break which gives the Indian side a perfect reality check ahead of the 2018/19 ISL. The match will be played in the Pinatar Arena Football Centre in Murcia. This will be a great opportunity for Steve Coppell to check the strength of the players, especially the foreign recruits in the likes of John Johnson, Andre Bikey, Everton Santos, Kalu Uche and others. While the Indian players like Ricky Lallawmawma, Prabir Das, Sheikh Faiaz and Eugeneson Lyngdoh will get valuable experience playing against the London based club which is currently placed at the 13th position in the English Premier League standings. This is the second time that an Indian side is playing against a top-tier English club. Delhi Dynamos was the first club to play against a Premier League side when they locked horns with West Bromwich Albion in a friendly in 2016.